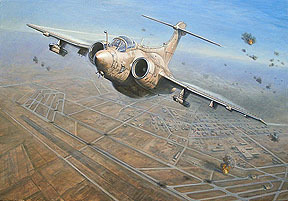 "The only replacement for a Buccaneer is a Buccaneer". Heard too many times to mention! Initially set up some years ago to promote the Buccaneer following its imminent retirement from Military service. Also to illustrate the many photographs taken by me, Andrew Brooks during the final 6 months of flying from Lossiemouth, The Blackburn Buccaneer Website has grown continually and become a very popular choice for Buccaneer fans and ex aircrew alike! If you are ex Buccaneer Aircrew, Ground crew or associated with the Buccaneer in anyway and have a story to tell that you would like to share, please do contact me! my connection and affection with the Buccaneer? There are different sections within our site but the site is biased towards photographs! Flown Prints: A selection of Sqn Prints and Photographs actually flown onboard the final flights of the Buccaneers! A must for Buccaneer enthusiasts and collectors alike! And of course, many Photographs mostly taken by me! Most are available to purchase should you want to grace your home or office with an image of this amazing British built thoroughbred! Production, Test Flights & Aircraft Carrier Trials: A selection from those 'testing times'! Below was originally written to be a part of the 'Sky Pirate' Limited Edition page to explain why it was so important to me to commission a painting of the Buccaneer? After writing it and realising just how much the words provoked so much within me, I decided it was better placed on the main page of this, my Buccaneer site! My association with the Bananajet is well known! However, what is less known is just how much events and the people I met during my time in Scotland in 1993-1994 actually changed my life and still continues to do so today! How little I knew of what was to come as I captured on film the final months of the Buccaneer's service with the RAF! Since then, my photography has appeared within the pages and on covers of numerous publications and books over the years. I am still always very proud indeed when I see any of them in print! It makes the endless hours of driving and countless trips to Lossiemouth and Tain (and all the other places), so worth the effort! One way or another, I owe the Buccaneer much! Ever since, I have tried, in my own way to promote the aircraft and the crews that flew her! Through this website I have felt the satisfaction having played a role in putting back in touch many old friends who were associated with the Buccaneer! I have had the hairs on the back of my neck stand up as I passed on a message from a badly injured soldier 20 years later to the Pilot who put his own life on the line to help save his life and others and over this time have had literally hundreds of emails relating to either my photographs or the Buccaneer in general! It is clear the Bucc was and still is, loved by many! Because of the Buccaneer, I have had the privilege to work with some of the World's elite Air and Ground Forces! I have flown in and photographed some incredible aircraft! I have shared the same air space as my hero's of yesteryear! I have been to amazing places and seen amazing things! I have also felt intense fear coupled with overwhelming excitement as every cell in my body came alive when I thought I might receive a bullet or two during some more interesting excursions! But most of all, I have had the honour to meet, share time with and work alongside some of the finest and professional people one could ever want to know!! For this I am truly proud and forever grateful! All of these events and many hundreds more would never have happened without my meeting with Roy Boots baby and the people who flew her! Yes, the Buccaneer changed my life! Enjoy your tour and please, if you have any questions at all, PLEASE just ask away!